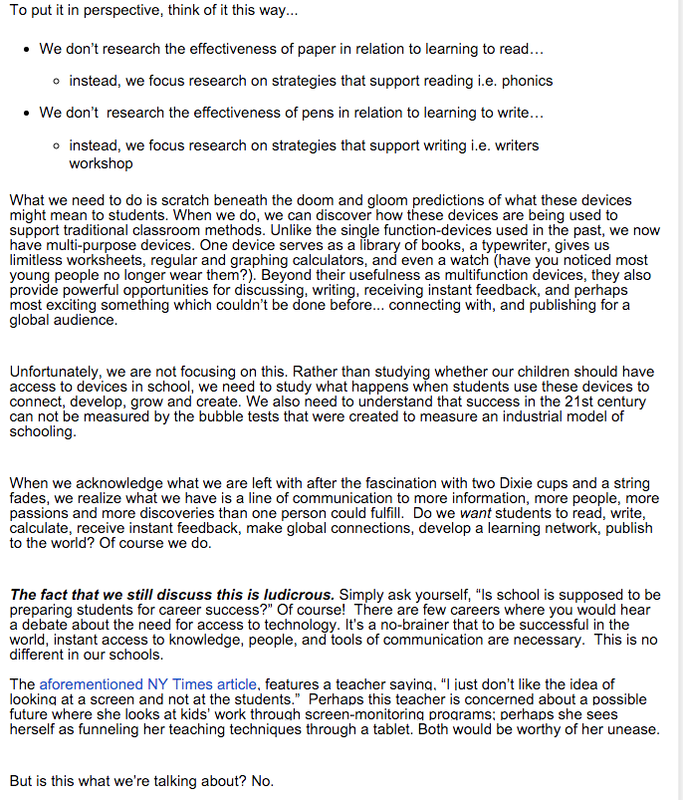 In case the Innovative Educator's blog post disappears, here it is in screenshots. 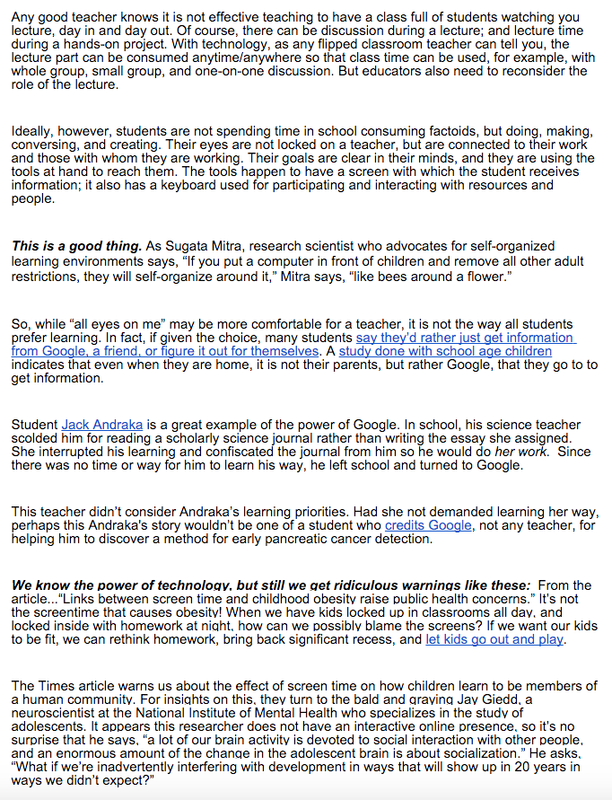 So, while “all eyes on me” may be more comfortable for a teacher, it is not the way all students prefer learning. In fact, if given the choice, many students say they’d rather just get information from Google, a friend, or figure it out for themselves. A study done with school age children indicates that even when they are home, it is not their parents, but rather Google, that they go to to get information. Student Jack Andraka is a great example of the power of Google. In school, his science teacher scolded him for reading a scholarly science journal rather than writing the essay she assigned. She interrupted his learning and confiscated the journal from him so he would do her work. Since there was no time or way for him to learn his way, he left school and turned to Google. This teacher didn’t consider Andraka’s learning priorities. Had she not demanded learning her way, perhaps this Andraka's story wouldn’t be one of a student who credits Google, not any teacher, for helping him to discover a method for early pancreatic cancer detection. Any good teacher knows it is not effective teaching to have a class full of students watching you lecture, day in and day out. Of course, there can be discussion during a lecture; and lecture time during a hands-on project. With technology, as any flipped classroom teacher can tell you, the lecture part can be consumed anytime/anywhere so that class time can be used, for example, with whole group, small group, and one-on-one discussion. But educators also need to reconsider the role of the lecture. Ideally, however, students are not spending time in school consuming factoids, but doing, making, conversing, and creating. Their eyes are not locked on a teacher, but are connected to their work and those with whom they are working. Their goals are clear in their minds, and they are using the tools at hand to reach them. The tools happen to have a screen with which the student receives information; it also has a keyboard used for participating and interacting with resources and people. 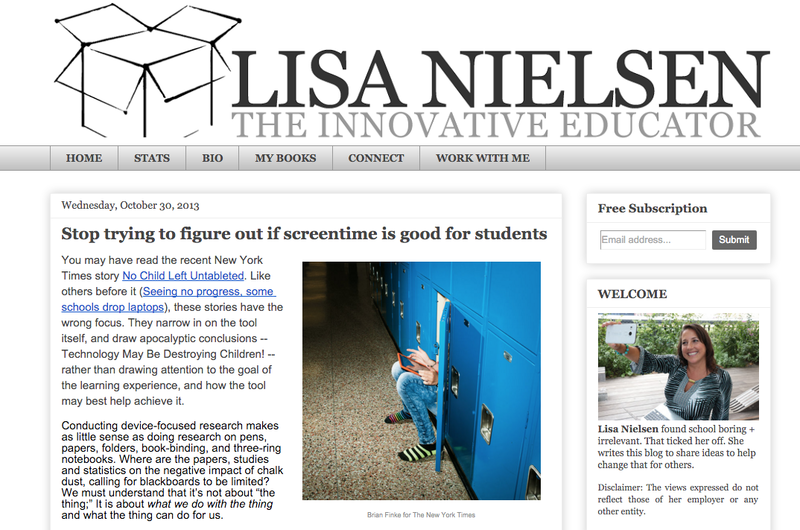 Be nice: Click on Lisa's blog and leave a comment. -Teach your kids that problems in the world are just opportunities in disguise. -Acknowledge that petty rules stifle creative thinking, so have less rules and encourage independent thought! -Most of all, love your kids and help them develop their potential and become the people they’re meant to be.